You know my love-hate relationship with drinking water. As in, I hate it and am trying to love it. As a little update on that front, we have successfully banned all regular soda purchases from our home, though we do occasionally buy some if we're at a restaurant. I mostly drink iced tap water all day now in my water bottle because it's the easiest drink to grab. I find I just don't drink as much as I used to, period, so I'm always a little thirsty. Let's take a moment, shall we, to mourn over my pain and suffering. Almost a billion people worldwide don't have access to clean, safe drinking water. They can't disdain the clear water streaming out of their taps, because — they don't have it to begin with. That kind of puts it all in perspective for me and makes me feel grateful that I have the choice to be so picky. Today is Blog Action Day, and the focus is on water. 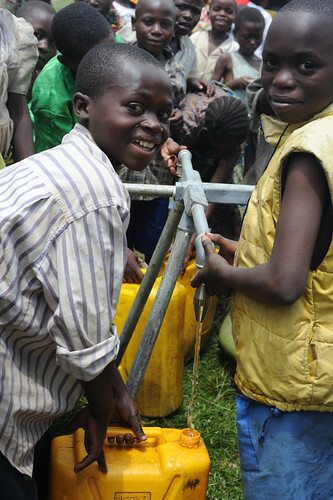 Nearly 38,000 children under the age of 5 die every week due to unsafe drinking water and unhygienic living conditions. The horror of that … when my sweet boy is over at the dining table playing play-dough with his dad. The idea that all these parents worldwide can do nothing to protect their children from the invisible organisms polluting their drinking water kills me. 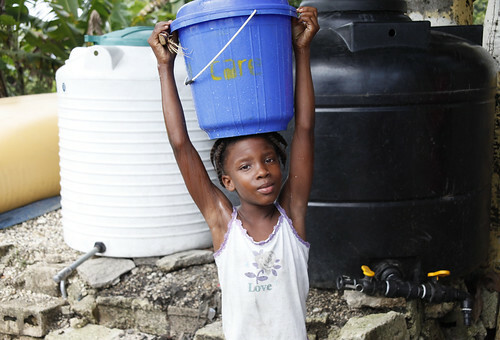 Lack of access to clean water affects mothers, girls, and young children the most — women who must travel long distances daily to find available sources of water, girls who are kept out of school to help their families survive, and babies and young children who are most vulnerable to waterborne diseases and malnutrition. This is a problem that affects people just like you and families just like yours, right now, worldwide. Stop drinking bottled water. It takes 17 million barrels of oil to produce all the plastic water bottles the U.S. uses each year — and 86 percent of them are not recycled. Each plastic bottle also takes 1.5 gallons of water to produce — so you're consuming a lot more water than you think. Enjoy your clean tap water, as much as you can, and try to reduce your global footprint on the environment. Conserve the water you use. The Water Footprint Calculator will help you determine how much you could save. Take shorter, less frequent (yes!) showers. Install water-saving faucets, showerheads, and toilets. Turn off the tap when you're not actively using it. Use rainwater barrels and drip irrigation to water lawns and gardens, and used cooking water for indoor plants. Buy a newer dishwasher and run it when full. Drive your car less by walking or using public transportation, which saves the water needed to produce gas and also lessens the impact of the oil industry on our water supplies, such as with the Gulf spill. Cut down on your electricity use, since electricity and electronics take a surprising amount of water to produce and use. Get more tips geared to your situation from the calculator. Eat water-saving foods. Dairy and meat take more water to produce than a vegetarian or vegan diet. You don't have to change your family's whole way of eating, but you could have a few meatless days a week to cut down on your water use. Buy things used, and reuse the things you have. It takes water to produce everything we manufacture: cars, clothing, paint, wool, plastic, electronics, furniture. Anytime we reuse something, we're saving the water that would be needed to produce the same item from scratch. So shop consignment stores and thrift shops proudly, pass on maternity and baby clothes you're no longer using, and ask yourself for each purchase if you really need it after all. Keep your water sources clean. Safely dispose of waste in your own home. Wash your car at approved facilities rather than in the driveway or street, where the greasy and soapy waste water will run into the drains or lawns. Pick up pets' droppings outside. Clean up after yourself near bodies of water. In the lawn and garden, choose environmentally friendly fertilizers and pesticides that won't leach into the groundwater. Consider cloth diapers. There are many debates about the environmental impact of disposables vs. cloth, but one thing cloth has going for it is the sewage goes where it belongs: dumped into the toilet or washed down through the washing machine pipes. Disposable waste, on the other hand, piles up in landfills, where it theoretically could leach into the groundwater. Water goes into the manufacture of disposables, though not as much as in the washing of cloth diapers; however, disposable manufacturing uses other resources and produces further wastes that could pollute the environment. Wash full loads of cloth diapers in an energy-saving machine on the lowest temperature and fewest amount of washes possible to still get them clean, and line dry when you can. 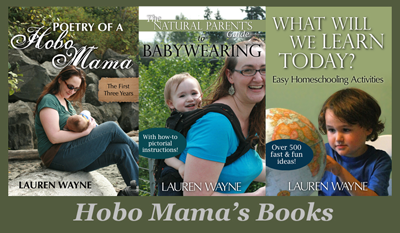 Reuse your cloth diapers for future children — your own or others'. If you live in an area that has them, consider a diaper service, which saves water per load compared with home washing and uses less water per diaper than disposable manufacturing. Try out elimination communication, too, as a way to cut down on diaper use altogether. Breastfeed if you can. This isn't a breast vs. bottle shaming session, just a realization that a person who breastfeeds needs some additional water for herself, but uses far less water overall than formula feeding and/or bottle feeding requires — not just the water in a bottle of formula itself, but the water used in the manufacture of the formula and the water needed to wash, sterilize, and heat the bottles and other equipment. Encouraging breastfeeding and reducing barriers to breastfeeding is particularly important in locations that don't have access to clean drinking water, where lack of exclusive breastfeeding and appropriate complementary feeding kills 1.5 million babies every year. If you breastfeed, you send a signal that can reach worldwide that breastfeeding is normal and beneficial, good for babies and the environment. Blog about it. Tell what motivates you to bring clean water to those who need it most, and then register your blog to say you did. Sign the petition. Support the United Nations in bringing clean water to children everywhere. I'm so happy to see so many of my friends joining in to support this cause. Happy Blog Action Day!